I’m telling you, the Blackhawks knocking off the Blues in the first round after falling behind 2-0 in the series just gets better and better. 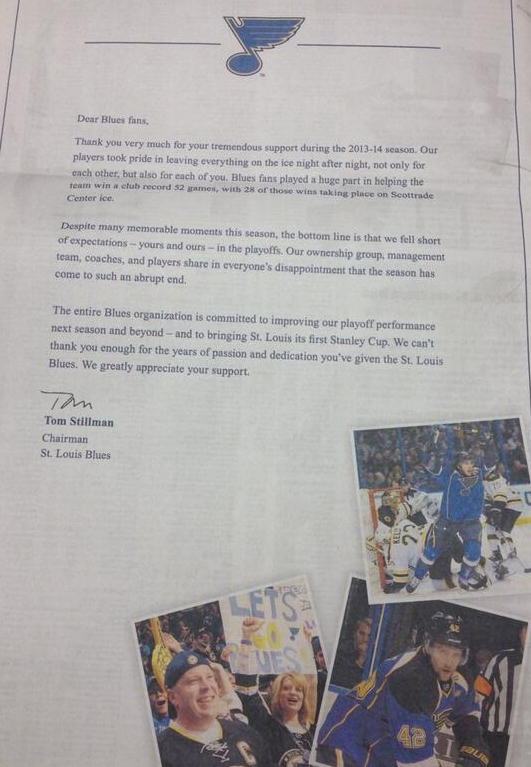 That right there is a full-page ad that the Blues took out in local newspapers to apologize to the fans for still being the Blues. Sure, assuming Blues fans can even read, let alone that they’ll buy a newspaper, seems a bit of a stretch, but I suppose it’s the thought that counts. If you can’t read the letter, don’t worry, I transcribed it for you. Thank you very much for your tremendous support during the 2013-14 season. We are truly sorry that, as an organization, we have absolutely no idea what we’re doing. The problem the last few seasons for our organization has been a lack of scoring. We just can’t score. So this year we made sure not to add any offense to our roster, but instead sign and trade for more guys who communicate through nothing but grunts, hand gestures and bowel movements. Despite all the bowel movements and grunts, it just wasn’t enough. We’re just going to have to sign more enforcers and hope that they can intimidate the goalie into letting them score. Because that’s how you win the Stanley Cup. And we would know, because we haven’t won any. In conclusion, once again, we’d like to thank you for showing up to the Scottrade Center all season long, in your jorts and your stained Nickelback t-shirts, as well as those three wolves shirts you wore without irony. We couldn’t have let anybody down without you. This entry was posted in General Stupidity by Tom Fornelli. Bookmark the permalink. The Nickelback comment was over the line. We can read. And we noticed all of your grammatical errors. Good work. Such an idiot. I’m thrilled you can read, as I always appreciate an underdog story. Now, would you be so kind as to point out all these grammatical errors I made? They get the internet in St. Louis now too? Times, they are a-changin!